As mentioned Christmas Day, Middle Son was given a Cycling Jersey for Christmas. This was sewn by me. Now many would wonder, "Why not buy one?" Well, that just not who I am. I sew. Besides, every time he wears that jersey, he will me receiving a hug from me. Since, I already had the pattern, Jallie 2216, from making some awesomely cool and perfectly fitting cycling shorts during summer, I had a beginning a tall, thin, growing twelve year old, it would be very difficult to find something to fit. If I did, I had real issues with paying $50+ for my son to advertise for their companies. Shouldn't we at a discount for promoting their products? 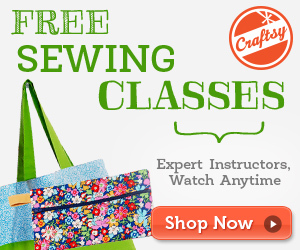 Jalie is a wonderful pattern company that makes patterns for men, women and children. They have many athletic, sporting and fashion patterns. Unfortunately, they have been discontinuing some of the men's. 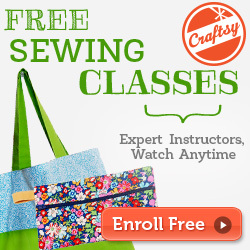 Always check their discontinued patterns for downloadable patterns that have been discontinued paper pattern line. This is where the cycling pattern is now. The patterns are multisized with toddler and adults included on strong white paper. I trace my patterns onto pattern paper for myself or my husband, unless I'm in a hurry or don't plan on using the pattern to death. Then I use tissue paper. I also trace for growing kids patterns. The tissue will usually last at least three times. On with sewing the cycling jersey. 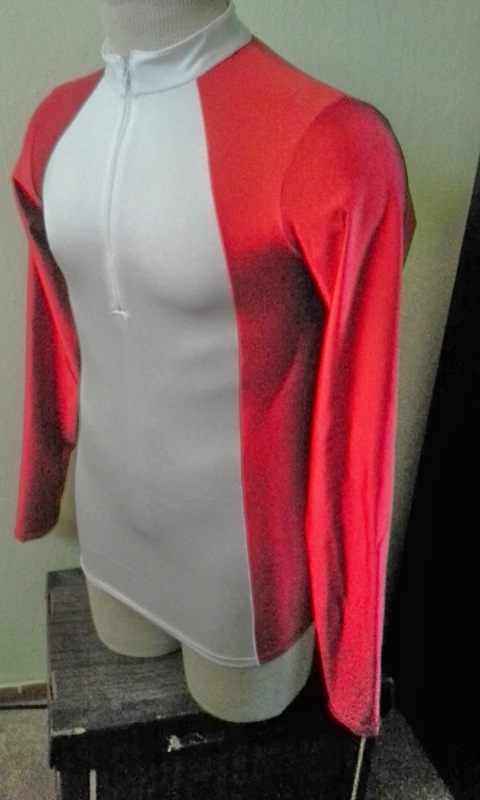 I sewed a size Q. I wanted this to be a surprise and couldn't try it on him. 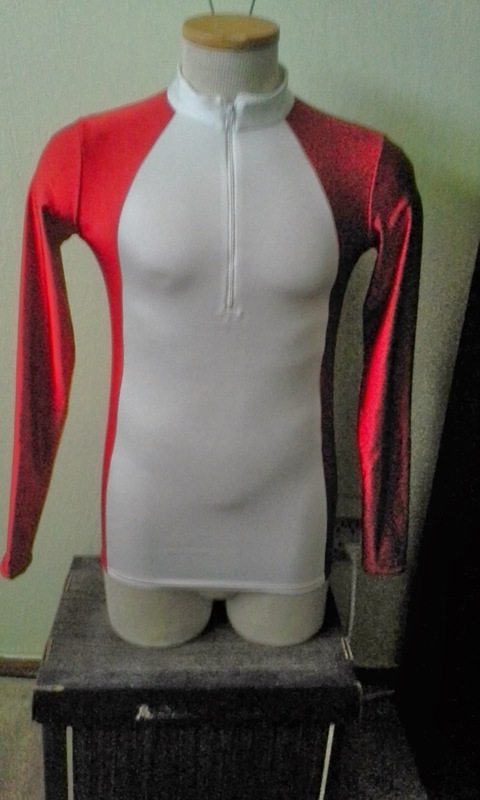 I used some nylon swimsuit fabric from Joann' s. I used red and white. I wanted neon, but he wanted it to coordinate with the bikes he rides. One is red and the other is red, white and blue. Next jersey is neon. Moms want vehicles to see and avoid driving over their offspring. 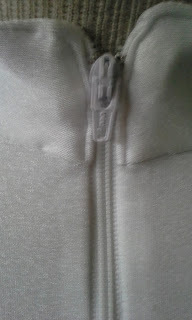 I also used a nine inch zipper and Wooly nylon thread in the loopers of my serger. I think the fabric and notions with my coupons was less than $25 and I have enough fabric for a solid red one. I would need a zipper though. I made few changes. I lengthened the sleeves, added an inch to the hem, and split the pocket into three instead of two. 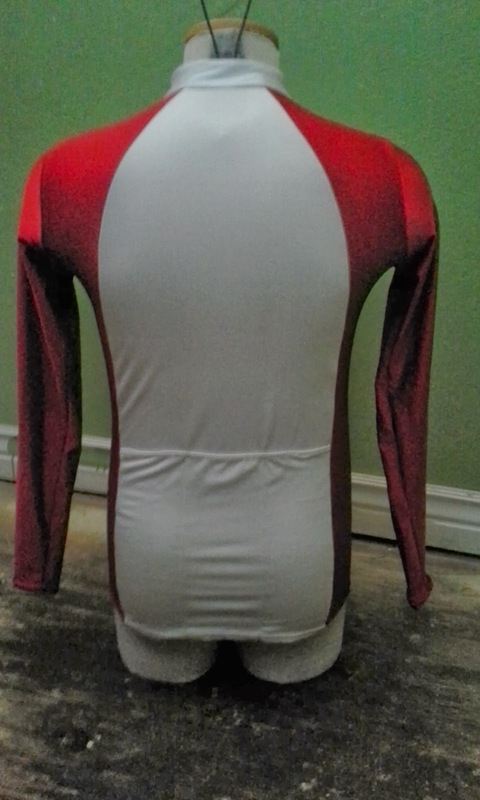 Since there is only an option for a short sleeve jersey, I used the measurements I covertly took. I told him they were for relatives who might want to buy clothes for him. I found the center of the sleeve and used that to extend the sleeve to the length I wanted, plus enough for a hem. I then used his wrist circumference, plus sleeve allowance, and divided it by two and drew out from there at the cuff. I then used the original sleeve and drew the sleeve to the wrists from the under arm of sleeve. Pictures sure would have helped explain. I followed the directions, which are generally very clear. At least until I got to the zipper insertion. There I was paralyzed with what to do. So, I put it away and hid it until I had time. I studied the zipper insertion again and it didn't come together in my head, so I decided to blindly follow the directions and the illustrations. I figured Jalie has never lead me wrong. I ended up with a pretty decent zipper for a first attempt on super stretchy, slippery fabric on a first attempt. A few little bumps here and there, but really, have you looked at what they let into stores? Once the zipper was done, I serged forward. I was a little concerned with the white thread in the red areas, but looked at other items in my kids closets, drawers and floors. The "professionals" do the same. In the end, it didn't show. The wooly nylon was great, giving soft seams. To finish the hems, I used a regular matching red thread in with a double needle and in the bobbin on the sewing machine. I had to loosen the tension on my Viking because it really wants to pull it tight when I use a double needle. Overall, it looked great. He loved it. 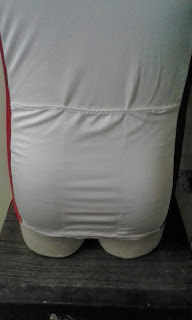 However, after he wore it around, I noticed a little skin showing in his shoulder seam. Apparently, the wooly nylon was unraveling. So, I sewed it together by hand. Of course every other seam started doing the same thing. I spent my Christmas morning fixing these unraveling seams. I guess I need to figure out how to end seams with wooly nylon on a serger before next wooly nylon adventure. Here are some pictures on Manny. The kids helped name him. Middle Son is smaller, but I can't manage to get him to hold still to get a picture. He also has the family curse that makes pictures look like we are completely terrified in all pictures. Here is the pocket detail. 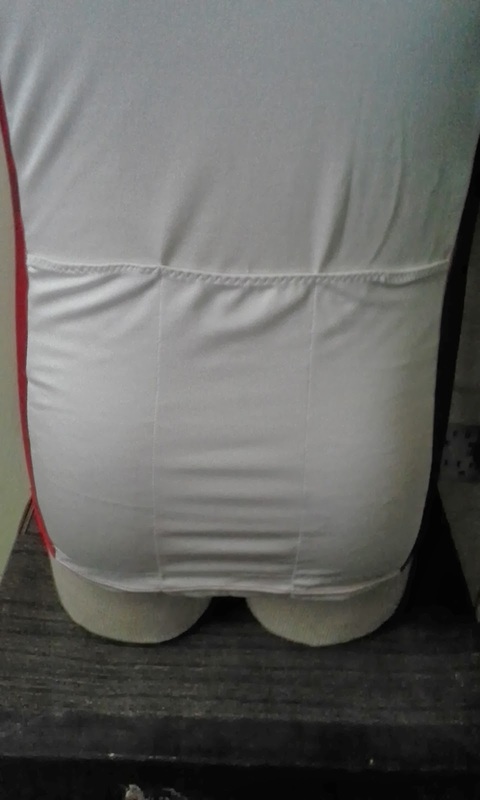 It is hard to see, but there are three pockets. Three help keep the shirt from twisting when there actually something in them. 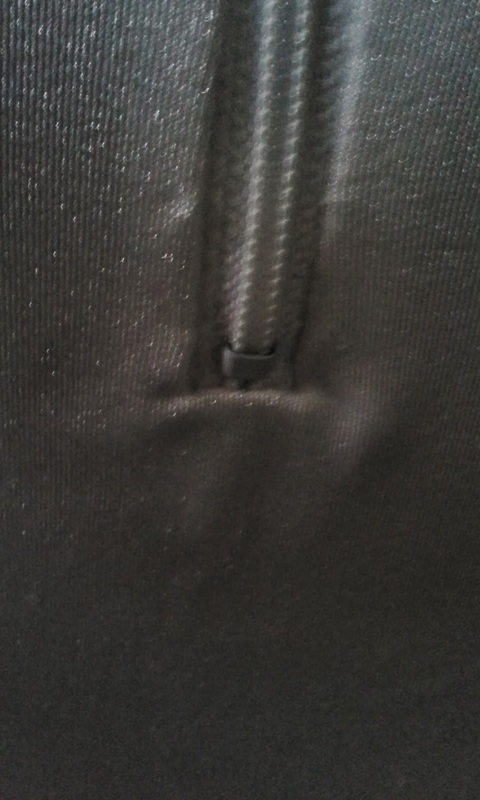 Here are my wonky zippers. No one else was polite enough to say if they noticed them. This seems like the time to tell you that this blog is over. 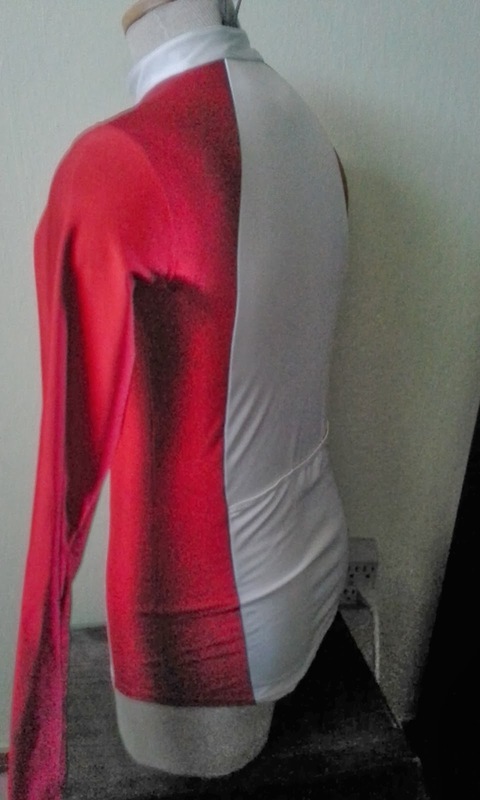 Wonderful looking cycling shirt! I'm sure it will be very useful. 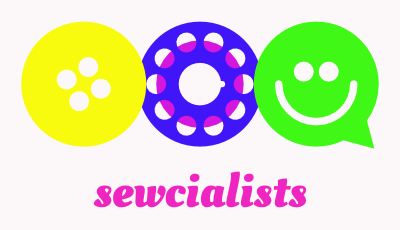 I think these specialty items can be some of the most satisfying to sew (compared to buying them).